The great Hollywood director William Wyler (Jezebel, Wuthering Heights, The Heiress, Ben-Hur) took John Fowles’ celebrated novel and turned it into one of the finest – and most controversial – psychological thrillers of the 1960s. 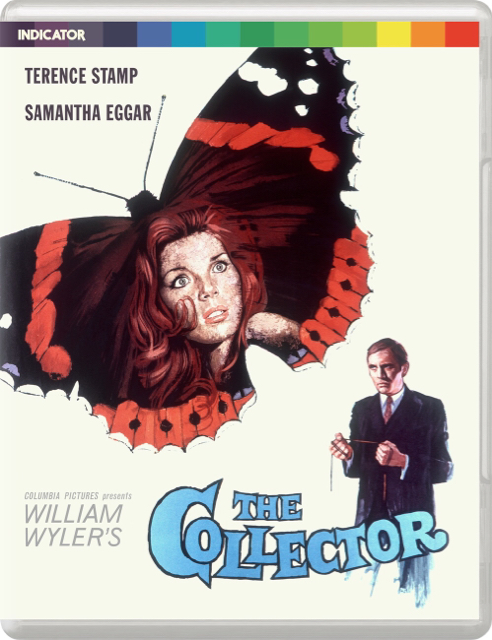 A lonely, unbalanced young butterfly collector (Terence Stamp, Far from the Madding Crowd, The Mind of Mr. Soames, Superman II) stalks and abducts a young art student (Samantha Eggar, Psyche 59, The Brood), keeping her imprisoned in a stone cellar as if she were one of his specimens. Stamp and Eggar won Best Actor prizes for their roles at the 1965 Cannes Film Festival, and the film remains a surprising and often shocking depiction of psychotic obsession. Normally do not comment about covers, but really really like the cover art here! Will definitely be offloading my Image disc and getting this. I've been wanting to read the book this is based on for a long time now! Correct me if I'm wrong, but it was basically the first in the "psychological thriller" genre, right? That's how I took the film (I haven't read the book). A key difference between the film and the book is that in the book we properly get inside both characters' heads - his in the first half, hers in the second. So the whole class and cultural snobbery angle is explored in much more depth - sometimes unconsciously on the characters' parts; the virtue of not only using two different first-person narrators but also kicking off with his POV, which is likely to be further removed from that of the typical reader of a literary novel like The Collector. That's interesting though it seems to me that Wyler succeeded in doing that visually if not with the explicitness of a proper narration. ^ I don't understand why directors feel the need to do this. As much as I love Stanley Kubrick, my respect for him went down a bit after what he did to Shelley Duvall on the Shining set. Such behaviour to me feels like a lack of confidence from the director in the actress' ability to get the desired effect of her own accord. John Fowles wrote about the problems on the set: Link. That was a fascinating read. Thank you!